There was a town practice dating back to the 1600s and continuing into the 1800s in America, carried over from English law, that if a community wanted to ‘protect’ its town and its citizens they could issue a ‘Warnings Out’. It was a method to have an individual, couple or even family leave the town to protect and secure the citizens of the town. This practice was found mainly in the New England colonies and later the New England states. It applied to those individuals not ‘native’ to the community, considered an outsider, who tried to settle in the town. If the town council deemed a new arrival a possible burden on the town, they issued the ‘warnings out’ served by the constable. When persons were warned out of a town, they were not necessarily forcibly removed but strongly encouraged to leave. Sometimes the constable would assist the person back to their native town. 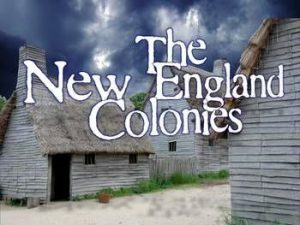 An example was in 1654 in the village of Rehoboth of the Plymouth Colony again Robert Titus. The village council told in person that Titus and his family had to leave because they allowed “persons of evil fame” to live in his home. It was believed the village citizens were responsible for the conduct and support of each other, each for all and all for each and not allow anyone undesirable. The ‘warnings out’ were also done for those individuals who were thought to be a financial burden to the community. It was a method to keep the homeless, paupers and ‘bums’ from being in a town. Of course the town always did take care of the widows, orphans and indigents who were natives (born there), so it was those non-natives who were generally asked out. 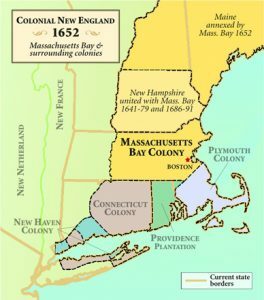 If you had ancestors during the 1600 to early 1800s in New England colonies and then states, you should check if they moved about to different locations. As far as good records, mainly Rhode Island towns kept the best ‘warnings out’ records. In other towns the records were held also held by the town clerk. The towns’ clerk records for Vermont are available with FamilySearch.org. Three others available with Familysearch include: Rhode Island, Massachusetts and New Hampshire. So something new to learn maybe about your ancestors, check it out. 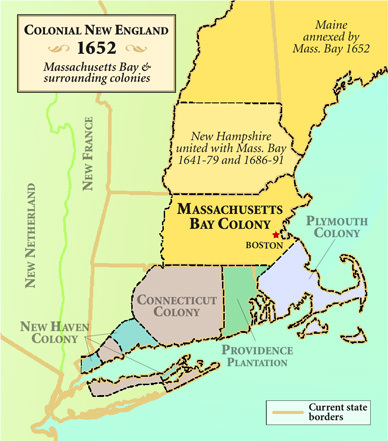 Photos: Colonial New England in 1652; and New England states map.